Blade of the Immortal is director Takashi Miike’s 100th film, a feat by any stretch of the imagination. With a limaareer that has spanned the early 90s until now, he has not slowed down one bit, directing an average of 3.8 films a year. He came to prominence during the height of Japan’s V-Cinema craze, which marked the rise of direct-to-video genre films. However, Miike, one of Japan’s most influential filmmakers, has made it a point to always push forward, to evolve, to remain fearless – and Blade of the Immortal is a testament to his almost zealous dedication to his craft. Based on a long running manga created by Hiroaki Samura, Blade of the Immortal follows Manji, a samurai cursed by a witch to live forever (bloodworms course through his veins and regenerate his damaged tissue). After fifty years of living in solitude, a young girl named Rin, who resembles Manji’s dead “sister,” shows up at his modest home to request his assistance: she demands vengeance for her murdered mother and father. 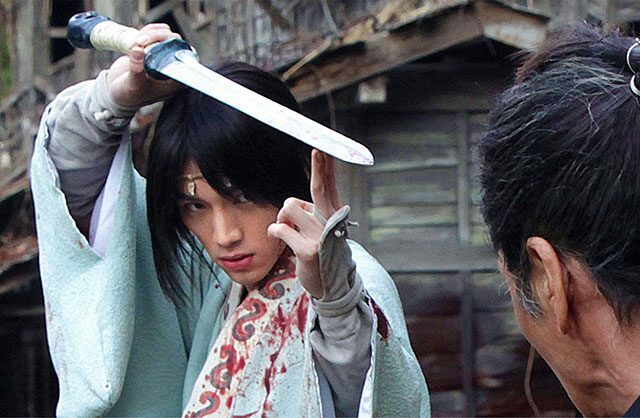 What follows is a samurai epic that rarely sheaths its sword. Miike, in a Q and A after the screening, explained that he insists on directing in the moment. Although he knows the ending of the film, he chooses to forget it to remain surprised and to maintain a level of authenticity to keep the film spontaneous and fresh (he famously came up with the conclusion to Dead or Alive only a few days before the end of the shoot). This dedication to his instinct emanates throughout the movie: every scene is a vital, tightly-paced, and slick with arterial spray. In recent years, Miike has reinvented himself as a revivalist of samurai cinema with the excellent 13 Assassins and the remake of Hara-Kiri. Blade of the Immortal, on the other hand, combines his penchant for stark black humor (as mastered in Visitor Q and Happiness of the Katakuris) with his mastery of frenetic, gravity-defying action and sparse, quotable dialogue. At times, Blade of the Immortal resembles Logan, but it’s important to remember that Marvel‘s R-rated superhero film was heavily inspired by Japan’s Lone Wolf and Cub. Miike is simply tapping into a storied tradition in Japanese cinema, that of the amoral and (sometimes) noble samurai bodyguard. The film’s only downfall is the long running time, clocking in at two hours and twenty minutes. The expansive experience, however, enhances the film’s gratifying climax that rivals the bodycount of Miike’s Ichi the Killer. With the final swing of Manji’s sword, the audience couldn’t help but cheer. Ultimately, Blade of the Immortal ranks alongside some of Miike’s best movies. With another film set to be released this year, let’s hope Miike can celebrate his 200th film in another twenty-six years.